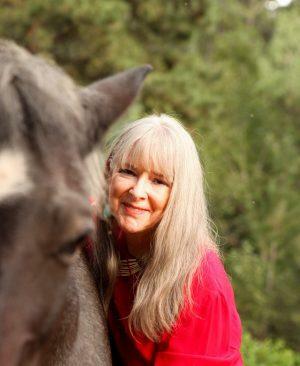 Linda Hogan with her pony, Misty. A noted author, professor and early UCCS graduate will deliver the university’s fall commencement address Dec. 15 at the Broadmoor World Arena. Linda Hogan, a member of the UCCS class of 1973, and CU Boulder professor emerita, will share her personal story and counsel for the future with about 475 new graduates and their families during the 2 p.m. ceremony. She will join Chancellor Venkat Reddy, CU President Bruce Benson and members of the CU Board of Regents in congratulating the graduates and the formal conferring of degrees for students who completed requirements for bachelor’s, master’s or doctoral degrees in August or December. In addition to her address, a campus reception and book signing is scheduled for 4:30 p.m. Dec. 14 in University Center 303. A public reading is scheduled for 5:30 p.m. View the registration site to RSVP. Hogan graduated from UCCS in 1973 when UCCS was in its infancy, having been hastily converted from a tuberculosis sanitarium in 1965 and known as Cragmor. She later earned a master’s degree from CU Boulder, though she took courses at UCCS. Later, she taught creative writing at Colorado College, the University of Minnesota and CU Boulder. Her poetry, “The Book of Medicines,” was a finalist for the National Book Critics Circle Award. Other poetry received the Colorado Book Award, Minnesota State Arts Grant, an American Book Award, and a prestigious Lannan Fellowship. In addition, she has received a National Endowment for the Arts Fellowship, a Guggenheim, and the Lifetime Achievement Award from both the Native Writers Circle of the Americas and Wordcraft Circle. Her nonfiction work includes “Dwellings, A Spiritual History of the Land” and “The Woman Who Watches Over the World: A Native Memoir.” In addition, she co-wrote, “Sightings, The Mysterious Journey of the Gray Whale” for National Geographic Books, edited several anthologies on nature and spirituality, and wrote the script for “Everything Has a Spirit,” a PBS documentary on American Indian religious freedom. She is involved with the Native Science Dialogues and the new Native American Academy and received the Spirit of the West Award from the Mountain and Plains Booksellers Association. She is a member of the Chickasaw Hall of Fame. “I am honored that such a distinguished alumna is returning to UCCS and will share her inspirational story,” Reddy said. “Professor Hogan’s life work is exceptional and demonstrates the potential that exists in the members of the class of 2017.” Recent past December commencement speakers include: Charles Greer, professor of neuroscience and neurosurgery, Yale University, a member of the class of 1971; Yusef Komunyakaa, a Pulitzer Prize-winning poet and professor, a member of the class of 1975; Scott Oki, a retired Microsoft executive and member of the class of 1974 and Robb Harleston, a C-SPAN host, and member of the class of 1983. About 950 students completed requirements in August and December and will earn degrees. UCCS also conducts commencement ceremonies in May.